...in Reverse! I know that hibernation describes escaping the extreme cold - but I wonder if there's a word for escaping the extreme heat! The last couple of weeks have been very hot - mid to high 30's and once even tipping over 40 (40 degrees is 104 F). Add to this the humidity from living on the coast! I did not grow up with heat like this so I retreat into my house and turn on the air conditioning! If/When these temperatures abate I hope to resume my normal lifestyle. I think even the birds dislike these extreme temperatures. They are active early in the morning and then make lots of noise as it cools down in the late afternoon. In between they find somewhere to sit it out! One of their favorite places is this tree in my back yard. Right now it is in flower but I haven't seen birds at the flowers so I don't think there is much nectar available. This is a Leopard Tree (Caesalpinea ferrea) which I planted 10 years ago. 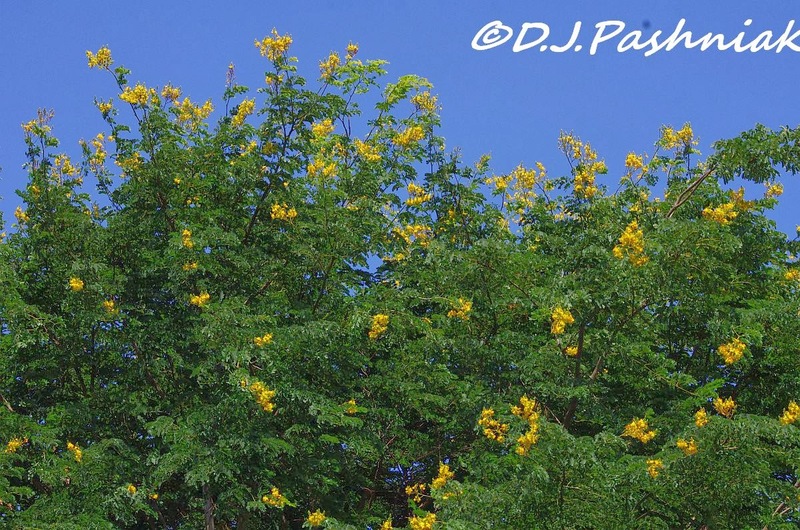 The trunk and branches reach high and then there is quite a dense canopy of small leaves. The birds sit right up high just underneath the leaves. It must be lovely up there - sheltered from the sun and catching any breeze that comes by. I can hear the birds up there but only see them as shadows against the light when they move. The trunk of the tree always has this pattern of dark and light. The other morning a flock of small birds flew over the house. (I was sitting beside an open door with a good cross draft.) Their call was not one that I usually hear around the yard so I watched to see where they went. 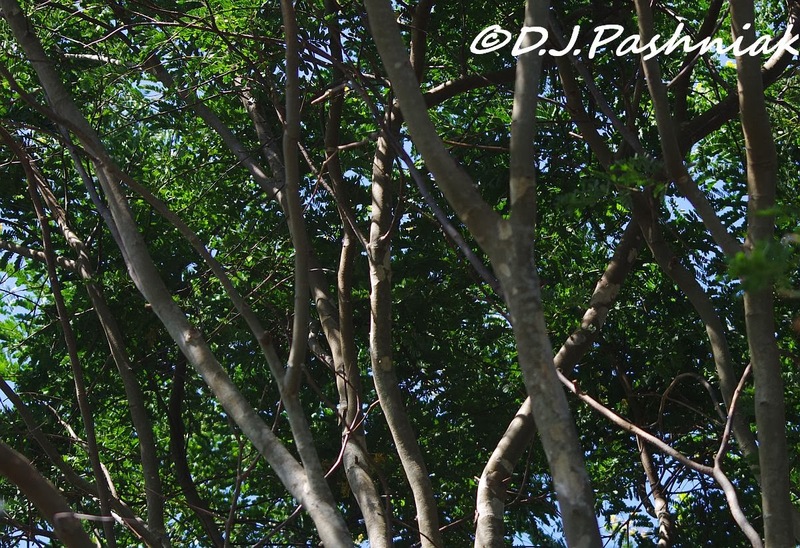 Most flew into the Leopard Tree but one sat on a branch of another tree where I could get a good view of it. A Tuckeroo tree (Cupaniopsis anacardioides) which has not grown so tall. It was still early in the morning (6:30) and the sky had that washed out color. 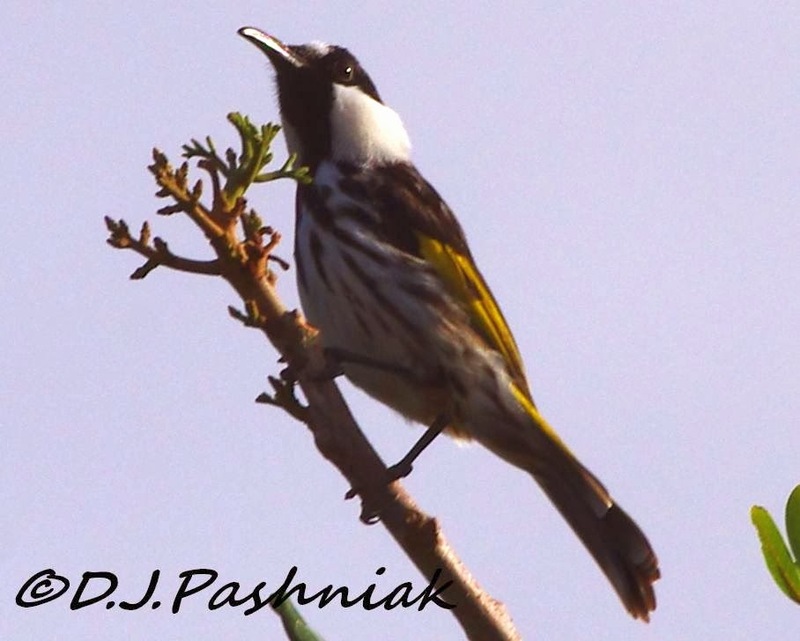 The birds were White-cheeked Honeyeaters (Phylidonyris nigra). I have only seen them in my yard one other time and they didn't stay around long. Update: The hot and dry weather broke last night in spectacular fashion! - a BIG storm with lots of thunder and lightning and 50mm (2inches) of rain! That is the most rain we have had for more than 5 months so it is very welcome. The weather bureau is predicting several days where the temperature is not going above 30 degrees (86F). What bliss!! I've not seen this type of honey-eaters down here in South Australia but we have many of the New-Holland honey-eaters which flit to and fro under our canopy of ornamental grape vines. Hopefully your hot humid weather will abate soon, giving you time to venture out into the great outdoors once again. Hi Dianne, We don't have New-Holland honeyeaters - I think the ones I have photographed fill the same niche. Your canopy of ornamental grape vines sounds good. such neat birds. we 'hibernate' here in texas in the summers, too. when it gets 105F+ for days in a row, there's just no staying outside for long. Hi Therese, It's interesting that you too resort to going inside in very hot weather. Glad you got the storm with lots of rain. Thanks Neil, It was a long time coming!! It's very cold in Canada right now but I admit that I like it cold better than hot. The honeyeaters are pretty little birds. Your photos of the snow and ice are beautiful but I wouldn't like to live with those temperatures. Wouldn't it be nice if things would just stay moderate all the time! Beautiful views… our temps keep fluctuating wildly… -10 F a few evenings ago… 43F today. HI Laura, Moderation sounds better to me! Not too hot and not too cold! Enjoy your cooler weather, we are down South! Hope your honey eaters stick around long enough for you to take some more photos, now they've found your shady Leopard tree they might do, nectar or no nectar! HI Wren, thanks for your comment. I have just been over to your blog and your trip sounds great. Google won't let me post a comment there unless I make another account for Google+ - and I really don't want to! I hope you come back here and see this and know I am not just ignoring your blog! I am glad the heat wave is over and you had some much needed rain. Pretty bird and I love the pretty blossoms. Thanks for sharing, have a happy week! Thanks for commenting Eileen. The rain gauge said 50mm but it is still very dry so hopefully we can get some more soon. Thank you, Carol. It is a beautiful tree and I don't feel that I have yet done it justice. 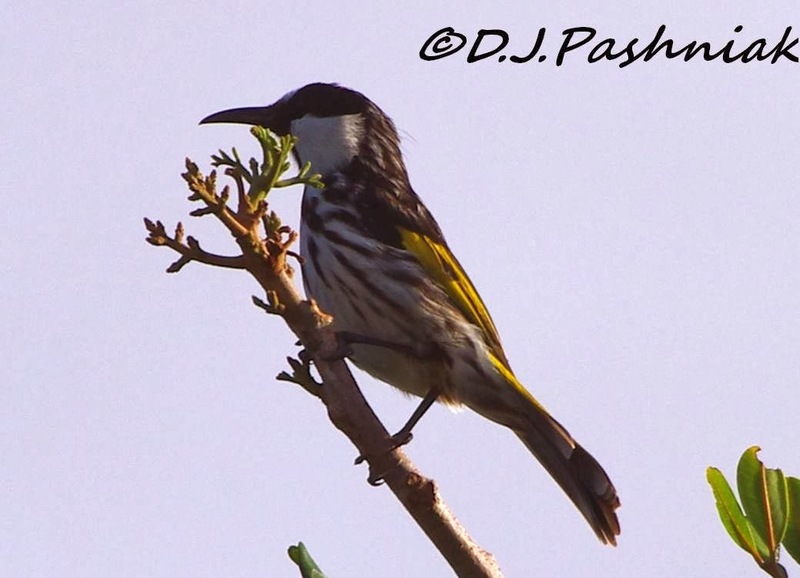 I enjoyed the photo of the honey eater. Glad you got the much needed rain and not Europe, where they have had so much. I wish you could send a little of that excessive heat up here to North America! Hi Cynthia, It sure would be good if we could share our excesses around the world! It seems extremes of weather abound everywhere. 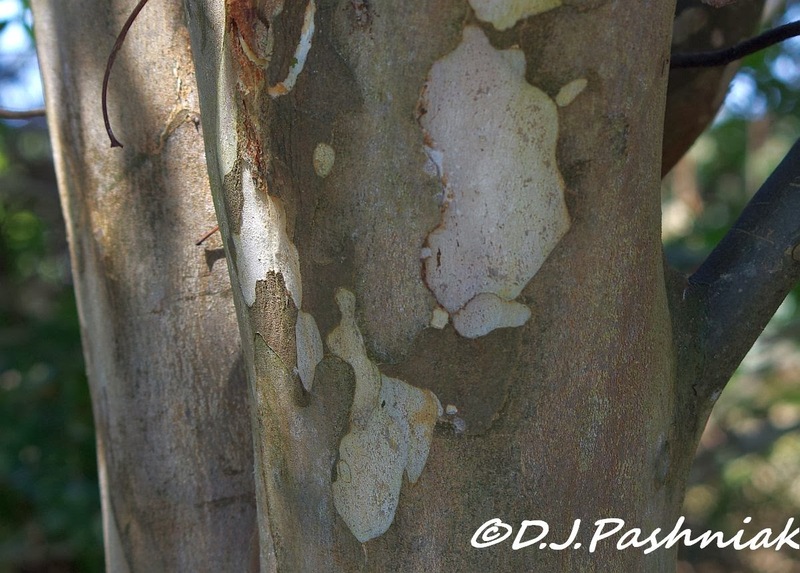 The bark of your leopard tree looks really interesting. Yes everywhere I read about how terribly cold and wet it is on the other side of the world. Thanks for your comment. I am very pleased I have seen this post - the Leopard tree you showed is the i.d. we have been needing! We have two of these trees in the grounds of the work offices and they are always full of lorikeets, wattlebirds and honeyeaters and we have wondered what they were called so we can plant some at home - now we know. Thankyou. The bird images are beautiful! Glad to hear you had some decent rain... if you tire of it.. send it our way! Hi Judith, I'm glad the Leopard Tree is the one you wanted to ID. Mine has been planted for about 10 years and is a good height. I watered it for the first 6 months or so but after that it has done OK with whatever rain we get down here. I have seen some in street plantings around here but they are small and spindly looking. The books say it can grow to 13 meters tall but I have seen one in a really good position that was much taller than that. I hope you can get one to grow on your place and that it attracts lots of birds. Wonderful shots. Glad to hear you finally got some cooler weather. Thanks for commenting Ladyfi - and would you believe it is cool and rainy again today! Very welcome. Thanks for commenting Cathy. I have no idea if the Leopard Tree is native or not. I bought several trees early on here - some worked out and some didn't! Neighbors who live here year-round (in SW Florida) tell us they hibernate in the summer...very high humidity and high temps drive them indoors for most of the day. We have relatives who live in Arizona and in the summer they play golf, shop, and swim before 10 a.m. and then hibernate in the AC all the rest of the day. I am glad we can move when it gets too hot and humid (and vice-versa, when it gets too cold and rainy and gray), but the downside of all that is, of course, that you have to be old and "redundant". Hi Sallie, very interesting to hear of places in your country that have similar summer problems. You seem to have solved the summer problems and have a really nice life-style. There are a growing number of retired people over here that take off in "big rigs" when the weather is either too hot or too cold. But they don't settle in one place and are commonly called "Grey Nomads"! Thanks for your comment Hans. I wish you could send some warmth down my peninsula way. It is so cold - in the mornings especially. Several times the heater was on. And then there are the cold winds too. O well. Summer has to visit us eventually. Love this white cheeked honeyeater. Gorgeous colouring. Hi Gemma, that sounds like typical Melbourne weather - so variable - and I remember having the heater on when I lived down that way years ago. This morning is lovely and cool again - such a change! Thanks for your comment Carole. I am glad I planted a Leopard Tree in my yard - and its even better that the birds like it. What a cool looking bird! Great shots, Mick! Hi Mick Yes this is a lovely bird to see and great you got a shot of it. Too warm with you, too cold for the US and Canada, massive floods in the UK, but I am OK here in Northern Ireland with very little flooding in some parts (not mine) so I guess you could say I was very fortunate. Such diversity of climates across the world but unfortunately so many places are experiencing extremes right now. I whinged about the heat around here - but lots of people have it much worse! Lovely tree and I am sure the shade is welcomed. I'm not a fan of the heat. Cute Honeyeater! Thanks for commenting Karen - not too hot and not too cold would be perfect for me! Beautiful bird! You were lucky to get some shots before it moved on. Thanks for commenting Gunilla, these birds are fairly common in the bush around here but I still haven't taken the photos I would like of them! Nothing beats the sound of rain on a roof after a long dry spell. Its going to near to 40 for the next few days - oh joy!